We live in a time when amazing progress has been made in the area of artificial teeth. Modern bridgework is designed to be indistinguishable from natural teeth and is made using fine ceramic material. 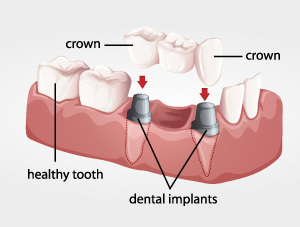 The result is a natural looking, comfortable and economical replacement option for missing teeth. How are dental bridges applied? Dental bridges are exactly what the name implies. When you have a missing tooth or even several, a dental bridge literally “bridges” the gap with a prosthetic tooth that is secured to neighboring teeth using dental crowns or dental implants. Do I really need a dental bridge if I don’t mind missing teeth? Besides cosmetic concerns, there are a number of reasons to replace missing teeth. Once a tooth is lost, the bone and tissue surrounding the missing tooth begins to deteriorate. As the deterioration worsens, replacement options become difficult and expensive. Missing teeth often lead to super-eruption, where existing teeth begin to reach up and out of your jaw causing a myriad of dental issues. Missing teeth can also contribute to TMJ disorders, shifting and tipping of existing teeth, speech impediments, overbite and gum disease.